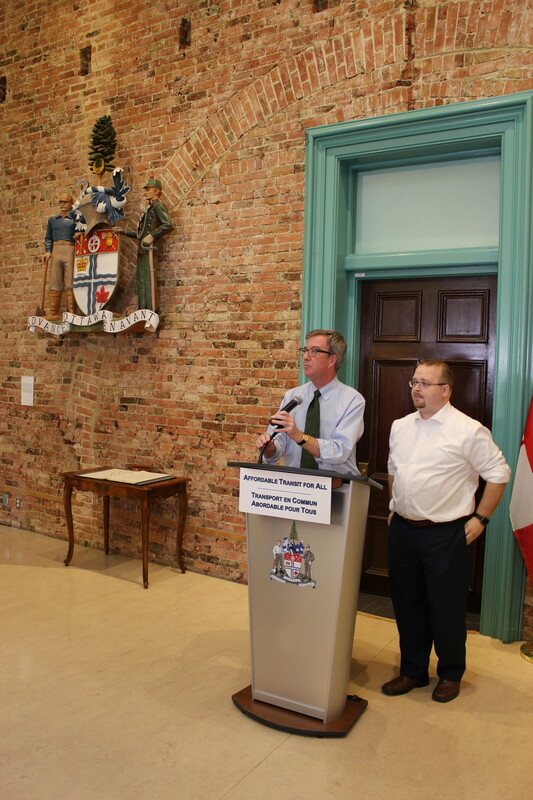 Ottawa — Today, Mayor Jim Watson, along with the Chair of the Transit Commission Councillor Stephen Blais, announced that a low income transit pass will be included in the City of Ottawa’s 2017 budget. The low income transit pass will be available at a significant discount on the adult general monthly fare for those residents who are at or below the income cut-off (LICO) as defined by Stats Canada. It will be available to residents with an annual individual income of approximately $20,000 or less, or a family income of approximately $38,000, for a family of four. The specific discount of the pass will be revealed when the budget is tabled at Council on November 9. This announcement comes after a year during which options to provide a low income transit pass were thoroughly debated in our community. Time and again, Ottawa residents have indicated that they support the City’s efforts towards providing lower income residents with affordable access to transit. The low income transit pass will be offered as a new type of monthly transit pass and will not be subsidised by the cost of other transit passes. City Council’s policy on the amount that OC Transpo collects from its riders versus the amount it collects from taxpayer contributions to transit will remain the same. This affordable transit pass could benefit as many as 8,800 eligible low income transit users.